Has the 2015 actually started yet because Sunday Night sure does feel like a long time ago. The weather is not much better than last night, maybe a little warmer, and less wet, so the Cubs will be on schedule this afternoon. 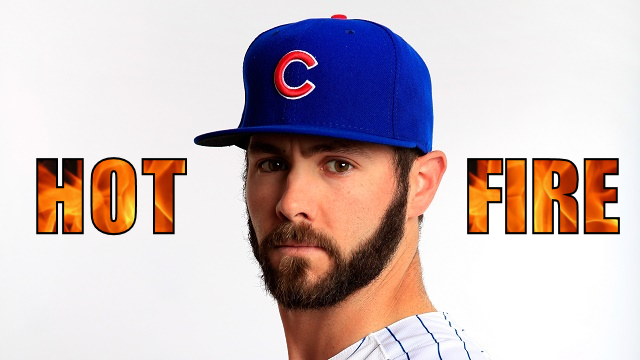 Jake Arrieta makes his 2015 debut against Lance Lynn and the Cardinals in the final game of a rain shortened two game set at 1:20 PM CST on ABC 7 Chicago, sounds weird. Here is how both teams will lineup this afternoon. Darwin Barney and his wife made a baby, because of that, we get Arismendy Alcantara! Now the news around baseball is that Alcantara will be up for just two games while Barney is on paternity leave, hopefully that paternity leave lasts longer, like three months. I don’t think a decision has been made with Alcantara yet, he belongs in the Majors, and has done nothing but hit recently at Iowa. Lately, Alcantara has been playing CF, I think that’s a clue as to what might happen when Barney returns, we’ll see what happens but we will be seeing more of Alcantara moving forward, and that’s a good thing. The Cubs look to play a full nine innings tonight, and even up the Series against the Rockies. Jason Berken will get the ball for the Cubs tonight as he continues to vie for a spot on the 2013 roster. Here’s how the Cubs will line up. Chris Rusin gets the ball tonight against the Rockies. Here is what the rest of the Cubs lineup looks like against Jorge De La Rosa. The game is set to start at 7:40 on WGN.